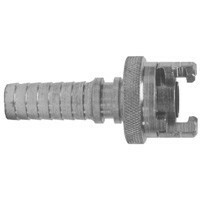 # DIXPHL6FS - Hose End Barb with Knurled Flanged Sleeve - 3/8 in. Large, raised collar sleeve permits easier handling when wearing gloves. Zinc coated.